XIAMEN, Fujian - Tea merchant Li Zhihong is striving to tame Taiwan Oolong tea on the mainland. "The tea originally came from Fujian, just like me," said Li, whose father moved to Taiwan for business in 1947. The 50-year-old merchant said the Oolong tea in Taiwan also originally came from Fujian hundreds of years ago. Affected by humidity and high altitude on the island, it gradually evolved into Taiwan Oolong tea, with its unique fruity aroma. 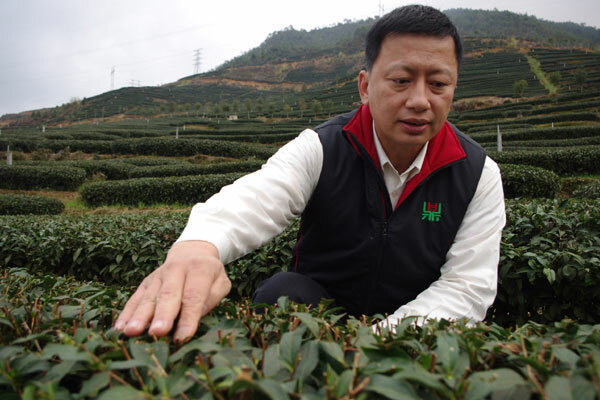 "Now I'm trying to bring it back to the mainland, which has a larger growing area and a bigger market," said Li, who founded a 160-hectare tea plantation in the mountainous town of Yongfu in Fujian province in 2004. Li has invested more than 10 million yuan ($1.5 million) in his plantation and production will reach 50,000 kilograms this year, up from 35,000 kg last year. Li patrols his garden every morning. He said the Taiwan plants have taken root and flourished after years of effort. Many people doubt Li's tea can maintain the same aroma as Taiwan Oolong tea, but he isn't deterred. Li attributes the unique aroma of Taiwan Oolong tea to the low temperature at an altitude of 1,000 meters on Ali Mountain, the landmark mountain on the island where the majority of Taiwan Oolong tea grows. "Low temperature allows the tea to grow slowly enough to store the aroma in its leaves and the mountain's high humidity protects the tea's young leaves from drying," Li explained. To ensure the tea retains its unique aroma when grown on the mainland, Li has found a location for his tea garden - also at an altitude of 1,000 meters - on the hills around Yongfu that have an environment similar to Ali Mountain. Seen from a distance, mist wreathes the top of the hills, neatly trimmed tea shrubs are planted in rows, covering the middle of the mountainside. Before visitors get halfway up the hill, the fragrance of tea leaves, the smell of moist and fresh earth drift down. Every 55 days from April to October workers collect the buds with two adjacent leaves slightly unfurled. And thanks to cheaper production cost and human resources, Li waters the tea plants with soybean milk 25 days before each harvest. Li said the milk watering enhances the tea's balminess and makes the sweet aftertaste last longer. It costs him at least 500,000 yuan each year, but it would be much more expensive in Taiwan. "The milk watering is only applied on the mainland because here we can afford the cheaper material and human resources," he said. During the busy season, nearly half of Yongfu's 46,000 locals work in the plantation, he said. "(With such milk watering) I believe the Oolong tea will evolve into a better variety, as its ancestor did in Taiwan," Li said. Born in Taipei, Li returned to Yongfu for the first time in 1987 to pay tribute to his ancestors - his grandparents and other kin were buried there. "It was a very poor village," he said. "The streets were cluttered with garbage and humble flats made of wooden planks. The floor creaked whiningly beneath my feet. I worried it would collapse at any moment." Though he had thought about helping the local people, it wasn't until years later that Li decided to give up his antiques business in Taiwan. By then the Fujian government had put forward a series of preferential policies in terms of insurance and taxation. In 2004 Li became one of the first to move to Yongfu, the largest production base of Taiwan Oolong tea on the mainland, also known as Development Park for Taiwan Farmers. The park has attracted more than 400 Taiwan investors like Li. He said Fujian is one of the best places for Taiwan farmers to expand their businesses: it is geographically close to Taiwan and its natural environment is similar to the island. "More importantly, as a descendant of Fujian people, the cultural environment is familiar to me. It is where my family tree has its roots," he said.